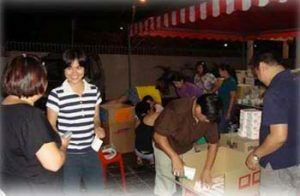 October 2009: Ireka Corporation Berhad made contributions to the victims of Typhoon Ketsana which hit Manila, Philippines on the 26th of September 2009, killing hundreds and leaving many homeless. As health hazards increased, there was a desperate need for medication due to the contaminated water. The Management of Ireka Development Management Sdn Bhd (IDM) and i-Tech Network Solutions Sdn Bhd (both a wholly-owned subsidiary of Ireka Corporation Berhad), donated Oral dehydration Salts, Paracetamol, Anti-Diarrhea tablets and other medications worth RM6,235 in aid of the victims.